The town of Bellingham is larger than I had expected. It is the northernmost city of the continental United States with a population of more than 50,000 residents, and has the most drive-thru espresso stands per capita in the nation. The night I arrived the city was hosting one of its Sounds of Summer concerts — a series of free outdoor concerts for the entire family. Each night features performances by popular bands, local food vendors, and a 21+ beverage garden. I found my CouchSurfing host, Jenni, without much trouble and after unpacking my bike we decided to hit the town for dinner. After dinner Jenni gave me a tour of some of the town’s highlights. The following morning I went for a quick jog that turned into a six mile run. I don’t know if it was the fresh air or the beautiful landscape, but before I knew it I was three miles out and it was time to turn around. Later that afternoon Jenni took me for a hike of Oyster Dome, an amazing trail that rewards you with a view of Puget sound. View at the top of Oyster Dome. After a day of relaxation in Bellingham it was time to head for the Canadian border, but first I stopped at the town of Nooksack for breakfast. I walked up to the first person I found on the street to ask for a restaurant recommendation and he told me that I couldn’t go wrong with Three Flavors restaurant. “They’ll make you whatever you want, even if it’s not on the menu,” he winked. Then he added, “Tell ‘em uncle Z sent you.” Unfortunately the people at Three Flavors had never heard of uncle Z. I’m not sure what I had expected, but I would have settled for preferential treatment. Fortunately, just as uncle Z had said, they were willing to prepare the food as requested. Had I had a block of tofu in my pocket, I’m fairly certain they would have gladly cooked me a delicious scramble. The town of Hope, BC is located about 50 miles northeast of the border along the Trans-Canada Highway/BC-1. Expecting complications at the border I had set my first stop close to the border, so I arrived much earlier than expected. Fortunately my hosts, Frank and Sonja, were flexible and said to come on over. “If we’re not in the house we’re probably cooling off at the river, so come on back,” Frank said. I arrived at their house within five minutes and, after unpacking my bike, walked down to the river. Frank and Sonja have a lovely home that they’re currently renovating, and their backyard backs into the Coquihalla River. Later that evening we walked to downtown via the train tracks and enjoyed a Blues concert at the park. While walking around town I noticed a lot of posters of Rambo, so I had to ask. Turns out Rambo was filmed here in 1981 — the town scenes were all filmed in Hope and the wilderness scenes were filmed in its surrounding mountains. The town is preparing for October 2017, when they’ll celebrate the film’s 35th anniversary, hence the many posters I saw. Two days aren't nearly enough to see everything that Hope has to offer, so Frank helped narrow down the list and suggested I check out the Othello Tunnels and Hope Lookout Trail. I started early in the morning with a hike to the Othello Tunnels, a trail focused on the canyon of the Coquihalla River and a decommissioned railway grade, leading eventually to Coquihalla Pass. Five tunnels and a series of bridges follow a relatively straight line through the gorge, which is lined with sheer, flat rock cliffs. After lunch I tackled Hope Lookout Trail, which is a short walk from downtown and offers an exciting vista from a viewpoint 1,500 feet up the side of Mount Hope. The 1.5 mile trail climbs steeply through lush coastal forest, ending at a spectacular viewpoint perched on a rocky slope. 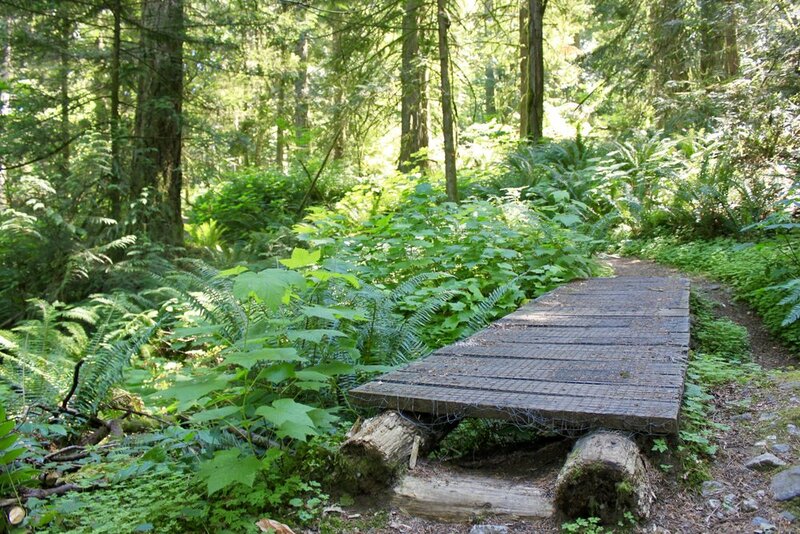 Some locals refer to this trail as “Hope’s Grouse Grind,” for its steep ascent and rewarding view. On the way to Hope Lookout Trail I stopped by the Visitor Center to find out more about the town, and this turned out to be a lucky move. Here’s where I first learned about the hundreds of wildfires that could potentially block my route north. Later that evening I joined Frank and Sonja for a swim at KawKawa Lake, an awesome way to cap a full day of hiking.